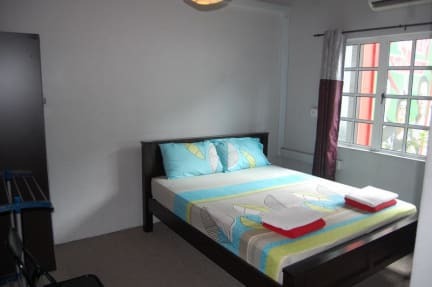 Sunshine Bedz KL is very highly rated by Hostelworld guests for its location, and it's little wonder why. They're located near KL Tower and the Petronas Twin Towers, next to a monorail station and across the street from the prestigious Lot10 shopping centre. This small hostel offers personal attention to each guest, with 'wonderful staff that really took the time to give advice in what to do and see, where to eat and where to go at night', according to our users, who also say the 'staff are so friendly, instantly making you feel at home and welcoming you into their little family'. Our simple, family-run bed and breakfast is conveniently located in the 'Heart of the Heart' of exciting Kuala Lumpur, along the famous Bukit Bintang Walk. Being newly renovated, Sunshine Beds is proud to boast of its new modern chic design, cleanliness and economically savvy rates! Breakfast consists of toast and coffee/tea. Across the road is the ever popular LOT 10 shopping mall, the Sungei Wang shopping mall. Just slightly further along the road (say a ten minute walk) is the infamous Low Yatt Electronic/Digital Haven Mall and just behind that is Berjaya Times Square (the only mall in Malaysia with a roller coaster in it!). And if you are keen on enjoying a beer or say dancing the night away, the glorious Changkat district of clubs, wine bars, restaurants, and cafes is just a three minutes walk. In addition to that, just downstairs there is a Watsons Pharmacy/Convenience store, a clinic, Money changers, McDonalds, and a police station just in front of that. But most importantly, the BUKIT BINTANG MONORAIL Train Station is literally a two minute walk from Sunshine Beds doorstep! The monorail can take you from Chinatown, to the KL Twin Towers (Suria KLCC), and even the Kuala Lumpur International Airport (KLIA). Had a great short stay at Sunshine Bedz KL. Great group of people + the staff were fun and accommodating. Thank you!! This is by far one of my favorite hostels I’ve ever stayed at. The rooms were very clean and the hostel provides a towel. The bathrooms were also clean and the showers were spacious. The hostel provides breakfast that includes toast, peanut butter, Nutella, and butter and jam. There is a very social atmosphere at the hostel and it could be considered a “party hostel” but the staff makes sure the noise level is down by around 11 pm each night. The location is also phenomenal! Staff was great!! Sunshine Bedz is sooo good! Staff were fun and friendly, and it’s a great place to meet people. Most people ended up extending their stay if they could, including myself, which shows that it’s a nice atmosphere. There was people going out every night, but if you wanted to just stay in and relax that was totally normal too. Also beer is cheaper at the hostel than at supermarkets so that’s another plus, definitely staying there again if I’m back in KL! Very friendly staff, nice clean room, perfect location (steps from the metro, familymart and food). Breakfast was basic but just what we needed. Excellent atmosphere. Patrick is the best; the hostel is so much fun and an amazing way to meet new people and share travelling stories. Thank you for a great trip! One of the best hostels i’ve stayed in in Asia. I met so many awesome people and had such a fun time. The staff really make it so thank you to James, Daniel and of course Patrick! Great location, friendly and helpful staff, very clean. Such a great hostel with the most convenient location in KL - close to cheap food, shopping, bars and transportation. Staff is absolutely amazing, welcoming and helpful - you instantly feel at home and taken care of here. It’s a great place to meet other travelers as well and the vibe is always good and fun! Perfect location for some of the best locations in KL. James, Daniel & Patrick are fantastic at bringing people together and making everyone welcome. All receptionists are friendly and super knowledgeable about things to do and see. Would fully recommend, will be back in a few weeks on my way home! I think our location would be our best feature. We're located really in the heart of the city, with all the malls and attractions just within walking distance. We've very close to the Petronas Towers (15 minutes) and the Menara KL (five minutes). The Bukit Bintang monorail station is also just a minute away. Personally, I recommend that our guests definitely don't miss Menara KL, and if they're going a little bit further afield I recommend the Batu Caves.